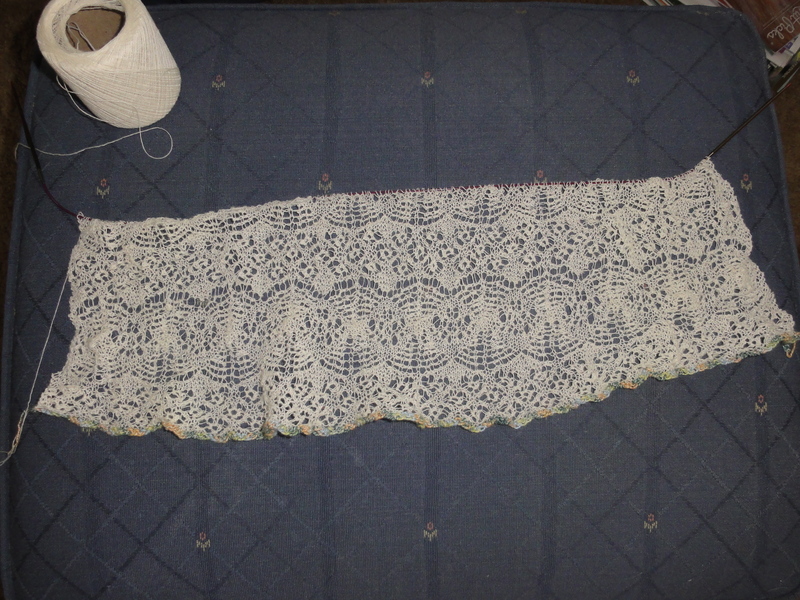 Many years ago, I bought a kit for Hazel Carter’s The Cat’s Day Shawl from Blackberry Ridge. 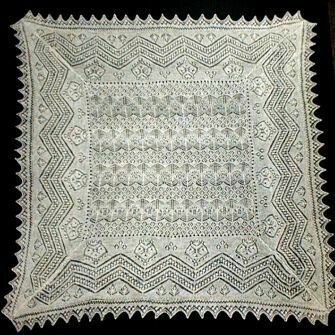 Like many of Carter’s designs, this shawl tells a story, the story of the a day in the life of a Shetland cat. 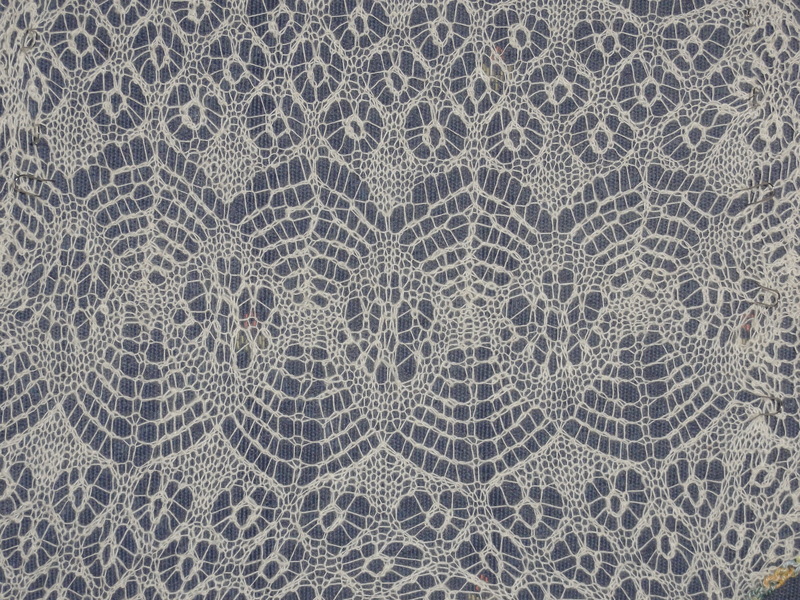 The lace patterns used in the shawl all represent elements of the story. A Cat’s Day was the first Shetland-type shawl I ever made, and much to my surprise, it was not at all difficult. The yarn is a nice heavy-laceweight wool-silk blend that feels good against the skin and that wears very nicely. 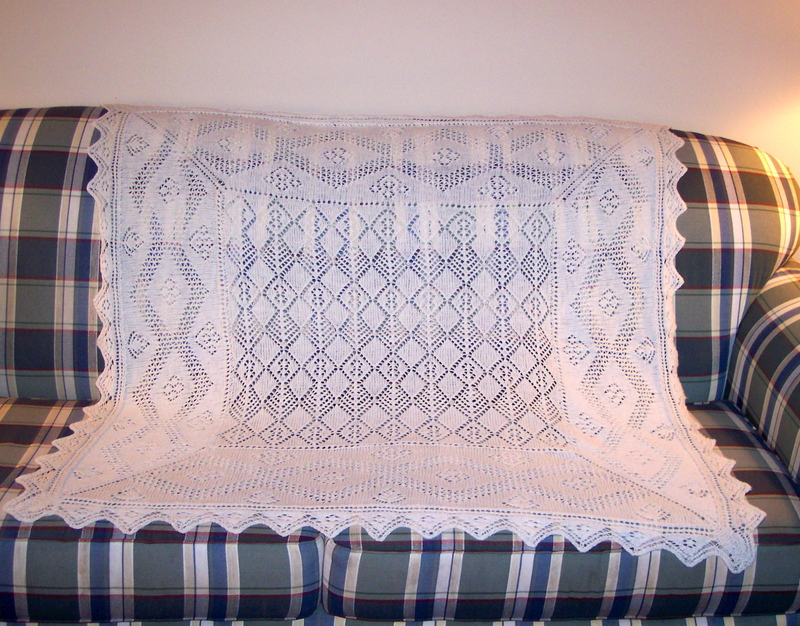 I’ve used the shawl a lot, mostly as a coverlet. It is lightweight and perfect to use when napping in air conditioning or for layering with other covers when it is cold. I love this shawl so much that I bought several other Hazel Carter kits from Blackberry Ridge, including The Spider Queen Shawl, which I think is dramatic-looking. The Spider Queen kit includes Blackberry Ridge’s Thistledown yarn, a cobweb-weight single. The kit marinated in my stash for a long time because I thought it would be difficult to knit. 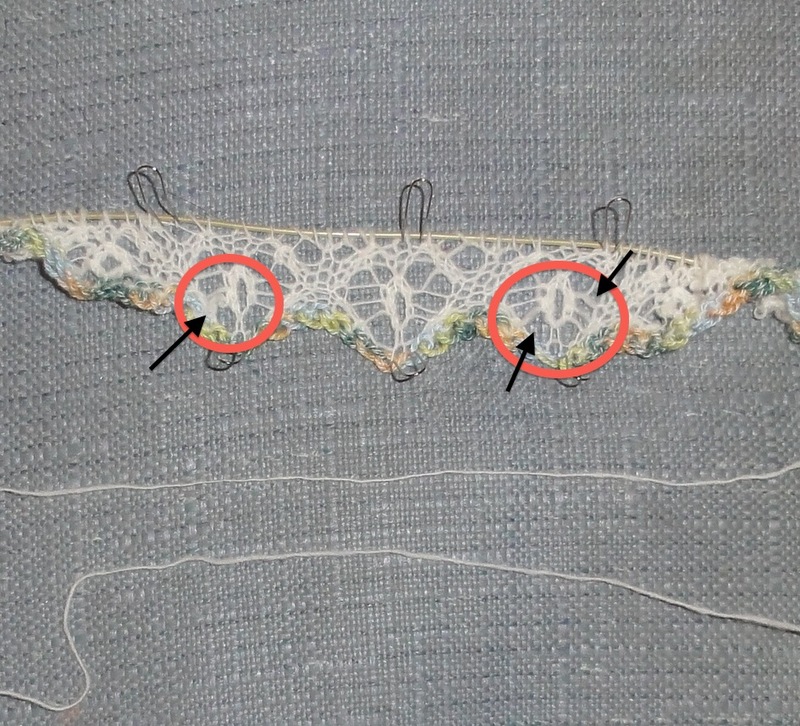 You see, the lace patterns used for the shawl are the type that have pattern stitches every row. A lot of lace patterns alternate a pattern row with a row that is plain knit (or purl), and I have little difficulty with this type of lace knitting. But the few times I have attempted patterns that include pattern stitches on every row, I have given up in despair. My Melanie Shawl has sat untouched for years because I found the going incredibly slow due to the difficulty I had getting the pattern correct. So I guess it’s understandable that it has taken me a long time to work up the courage to tackle The Spider Queen. But the lace patterns aren’t the only difficulty I had with starting The Spider Queen. Another reason I avoided The Spider Queen was because the borders are knitted individually, then sewn up. The seams look awful in the picture on the pattern, and I know that mine would probably look much, much worse, being that I really hate sewing up knitted pieces. 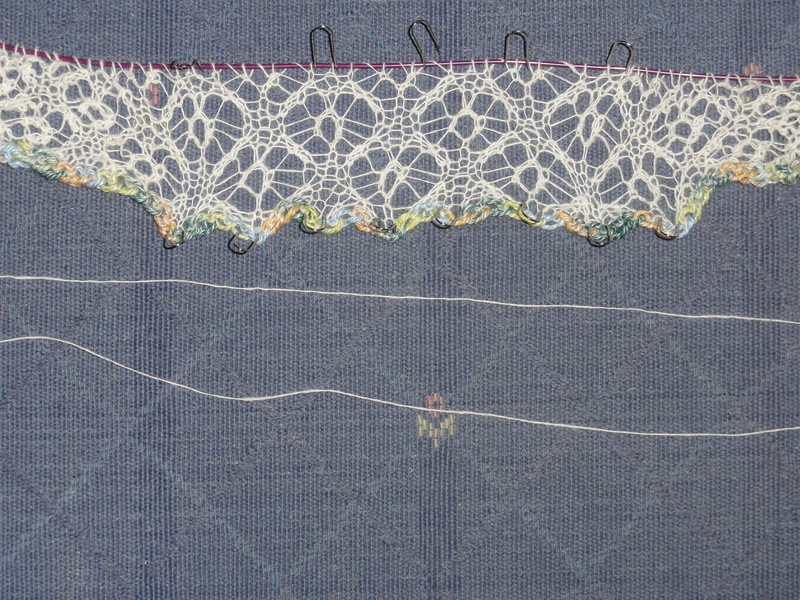 I have to come up with a way to knit the borders without having those ugly, ugly, ugly seams. But in spite of these obstacles, I had an overwhelming desire to knit The Spider Queen, so I took the plunge. The kit includes Blackberry Ridge’s Thistledown yarn, a cobweb-weight single. I cast on in Thistledown and started knitting away. I got this far before I stopped. Thistledown is a yarn with great variation in its thickness (or thinness, depending on how you look at it), and I was not pleased with how the thick sections looked. The Spider Queen in Thistledown. The fuzzy thick sections of the yarn ruin the appearance of the pattern. There was no way I was going to put so much work into this shawl using this yarn. I wasn’t about to end up with bunch of fuzzy places ruining the ethereal appearance of my shawl. So I decided to order some Jamieson & Smith cobweb in natural and start over. The Thistledown will be used for some other project somewhere down the road. When the J & S arrived, I realized it was even finer than the Thistledown, so when I cast on The Spider Queen for the second time, I went down a needle size. The J & S cobweb is also a single that has variation in its thickness, but the variation is considerably less than the Thistledown. In comparison to Thistledown, the J & S is nearly uniform in thickness, and it knits up beautifully without the difference in thickness being noticeable. The Spider Queen in Jamieson & Smith’s cobweb. No fuzzy thick spots. I’ve knitted one-and-a-half repeats of the center pattern so far, and I’m amazed at how quickly it has gone. Even though nearly every row includes pattern stitches, the pattern is easy to follow and the knitting is easy to read. I’ve had no difficulty whatsoever. The Spider Queen dry stretched. I have even been working on this shawl while watching the Stanley Cup Playoffs. It’s my lucky knitting, bringing good fortune to the Los Angeles Kings, who beat the Phoenix Coyotes last night to win the Western Conference championship, the Campbell Cup, and the right to face the Eastern Conference champion (either the Devils or the Rangers) in the Stanley Cup finals. Go, Kings! This entry was posted in Knitting, Lace Shawls and tagged Blackberry Ridge Thistledown, Hazel Carter, Jamieson & Smith Cobweb Yarn, knitting and hockey, Shetland Lace, stanley cup playoffs, The Spider Queen Shawl. Bookmark the permalink. Have you seen the Queen Susan Shawl on Ravelry? And yes, go Kings, go! Yes, I have, and it’s gorgeous. 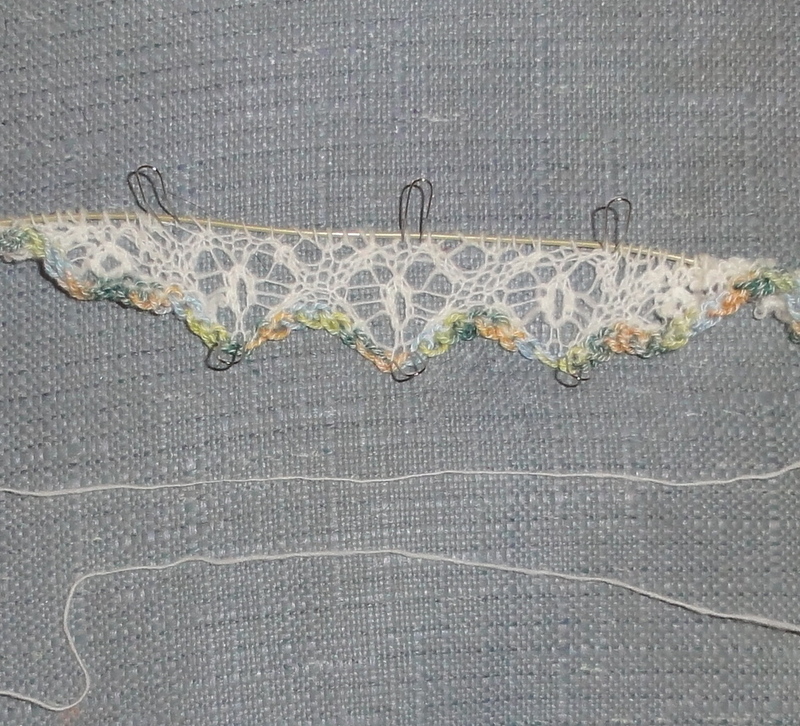 It’s somewhere in my very long queue of lace shawls to knit. I’m so happy to at least have a time I like going to the finals. I wish the Pens had done better in the playoffs, but I can very happily and enthusiastically cheer for Dustin Brown, Drew Doughty, Rob Scuderi, and the Kings. Thanks for posting this, it looks like a very beautiful pattern. I’ve been looking for something similar for a while. Thank you. Yes, it’s a beautiful pattern. Hazel Carter is a wonderful designer.